RC Guisborough & Great Ayton Held at the Parish Hall in Bow Street in Guisborough on the Friday & Saturday after Easter. 30+ real ales plus ciders, perry and local fruit wines. Come and sample our award winning steak & ale pies and lots more. Entertainment on Saturday evening. RC Middlesbrough Erimus Concert on 28 April at 7.30 pm in the Princess Alexandra Auditorium at Yarm School in aid of charity. Main charity is Butterwick Hospice. RC Tynedale FIND OUT WHAT ACTIVITIES AND SUPPORT ARE AVAILABLE IN OUR AREA. Visit the Tynedale Rotary Club stand and chat with us about what we do. RC Houghton-le-Spring Eat, drink, chat and dance the night away. RC Spennymoor President Elect Tony Jackson will be discussing the Rotary Year 2019/2020 for our Club as being the Official Club Assembly followed by Dinner. Rotary District 1030 is located in the North East of England and comprises 64 Rotary Clubs, serving their local, regional, national and international communities. Around 100 young, budding technology entrepreneurs took part in a dynamic new competition to find the region’s tech stars of the future. Organised and funded by Rotary North East with support from a number of forward-thinking technology companies, the first North East Technology Tournament took place in Sunderland with 13 schools from across the region competing. Rotarians are ordinary people who go that extra mile to help other people and in the process widen their circle of friends and enhance their social life. Made up of over 1.2 million Rotary members in 34,000 Rotary clubs in 200 countries and geographical areas around the world, Rotary International forms a global network of business, professional and community leaders who volunteer their time and talents to serve communities locally and around the world - and form strong, lasting friendships in the process. Rotary International in Great Britain and Ireland (Rotary GB&I), as the name suggests, is the association of Rotary clubs within England, Wales, Scotland, Northern Ireland and Ireland, comprising 53,000 members - men and women of all ages and backgrounds - in 1,850 clubs. Rotary clubs depend on the skills, expertise and dedication of their members, who work hard to change the lives of people in communities both at home and abroad. 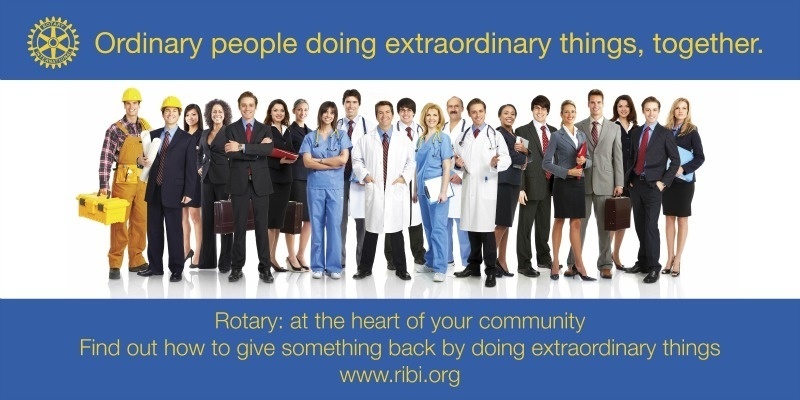 Find out more about Rotary in North East England by clicking on the image below. If you would like to join the Rotary family, volunteer your time to a community project or make a donation, register your interest and your local club will contact you with details of how you can help. Go to the Rotary Foundation page to read about our initiative to exploit the new Matching Grants procedures. Ian Hodgson, of the RC of Barnard Castle.